Open, bushy evergreen shrub or small tree with small mid to dark green leaves. 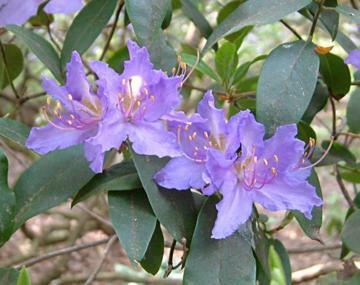 Trusses of broadly funnel-shaped, blue or lavender-blue flowers, spotted green-brown inside, in April and May. Reasonably fast growing. Moist, well drained humus rich acid soil. Will grow in full sun. Named after its discoveror, Augustine Henry and indroduced by Farges in 1899.